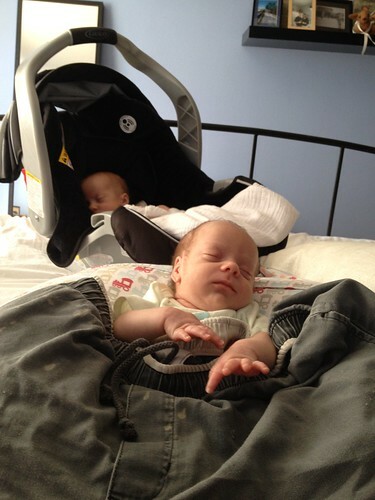 I keep hearing conflicting estimates on when the babies will sleep better through the night. Some people have told me it will take eighteen years. Some people have said it will last forever. Others have had shorter (but still undesirable) estimates such as eight months. Today someone told me twelve weeks. I choose to believe this estimate. It's a goal I can hold out in front of myself and ultimately be sorely disappointed. Twelve weeks would mean we're one third of the way through our relatively sleepless nights. I could do another eight weeks of this. I'd rather do none but eight weeks seems possible. It gave me a glimmer of hope that will likely be extinguished by disappointment forty weeks from now when they're still waking up every two hours. I left work a little early today because I just had to come home and try to get a little sleep. Elliott had a profoundly bad night last night, shrieking and inconsolable. Our entire night was spent trying to get him to calm down. We finally got him to get to sleep around 5:45 AM. I needed to leave for work at 6:00 AM. On my way home I picked up this week's farm share. 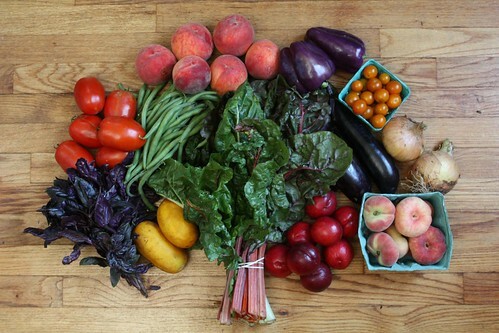 We got two pounds of tomatoes, cherry tomatoes, two eggplants, some Boothby Blonde cucumbers, Opal basil, purple peppers, Walla Walla onions, green beans, Bright Lights Swiss chard, peaches, nectarines, and donut peaches. When I got home I found Elliott chilling in a Boppy and Martin sleeping in his car seat. After calming Elliott a little more I couldn't find a blanket so I just covered him with some old stained shorts to keep him warm and fell asleep on the bed. I'm eagerly awaiting my "#1 Dad" mug. Nana popped in yesterday afternoon as our fourth round of outside help. This was much appreciated. 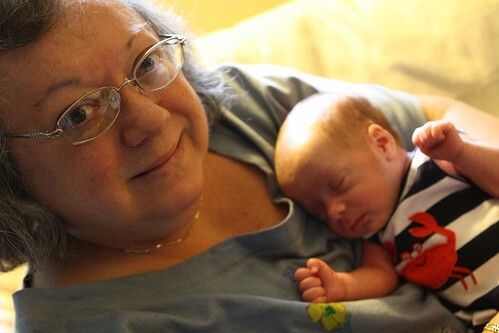 While the guys were happy to see their Nana, we were happy to occasionally be able to sit out a round or two of feedings/burpings. Unfortunately she uad the unenviable task of trying to calm Elliott last night while he was in full freak out mode. I only had about 30 minutes to put some dinner out while the babies were resting. 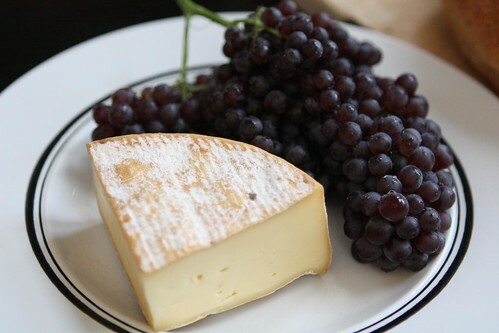 I started with this Von Trapp Oma from Trapp Family Lodge in Vermont with Champagne grapes. 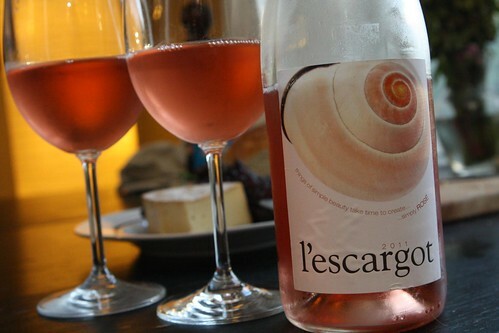 I poured Jen and Nana a glass of rose from l'Escargot. I have something of a linguistics background so I'd explain: "l'escargot" is French for "the escargot." I used some Gotham Greens gourmet greens as a base for this "Nicoise" salad. 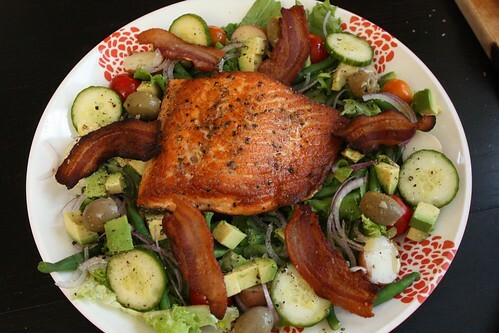 I pan roasted a nice piece of Norwegian salmon in olive oil with a few strips of bacon in the oven. With the greens I added farm green beans and tomatoes, cherry tomatoes from mom's garden, boiled potatoes, green olives, avocado, and red onion with some lemon, olive oil, salt, and pepper. 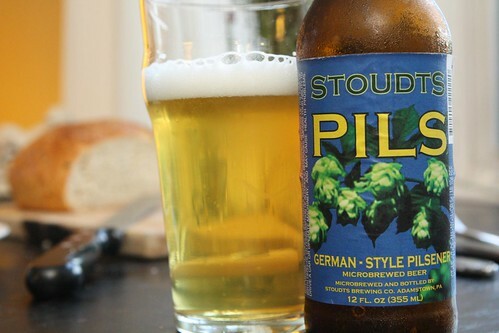 For a drink I poured myself this Pils from Stoudt's Brewing Company. This is not generally my favorite style of beer but this was a very nice, very refreshing beer with a lemony hop flavor. It was extremly light and paired well with the nice cool summer salad. After dinner we engaged in some baby-related activities. It generally takes me about twenty minutes to write a blog entry. Tonight was no different except that the twenty minutes was stretched out in four-minute bursts over the course of a couple of hours. Now I'm ready to return to bed as the effects of my short nap are wearing off. While we watched some Olympic track and field events, the babies settled down in their nineteenth century swimming attire and got some rest. Some grand mustaches would really have completed the look. I think, to be fair, you should mention that actually Elliott slept for at least one three-hour stretch uninterrupted PLUS a couple of smaller ones! Our pediatrician in Montreal asserted positively that you could get babies to sleep through the night at 3 months by feeding them cereal at 11 p.m. (I think in those days babies got solid food earlier than they do now.) I was skeptical but it worked like a charm with Paul. Charlotte starting sleeping "through the night" aka 6-7 hours, at 7 weeks... we were sort of crazy about the sleep training and her own crib, and read Ferber's book cover to cover :-) So, 12 weeks is totally do-able. Fingers crossed for you guys! Nice looking nicoise! Also, on the baby front, sounds like Elliot might have colic. It usually subsides at around the 6-8 week mark if I remember right. To help with the colic try gripe water (@whole foods) and what might seem like "rough" consoling. Football hold, face down, patting his back (MORE than just a gentle pat) while twisting in 180 degree motions. Sounds crazy I know, but if it's colic, it'll help. This blog is amazing for free parenting advice! Thanks, Everyone! We're going to start on the rice cereal tonight. 6-7 weeks sounds perfect! I can deal with that. I'll have to see what Jen's feelings are on Ferberization though I suspect if you support it, Elisha, she will be more likely to be for it. You can't argue with the experts! It could be colic but it seems like it doesn't last long enough at this point. And last night was pretty good, really good actually. I think he doesn't like 365 Organic Baby Formula. Either he would prefer I spend much, much more money on his formula or he just has developed a taste for corn syrup solids. I have spoken to your mother and you better hope that we discover that Genetics is a Crock if you think your sons will sleep through the night by 12 weeks. 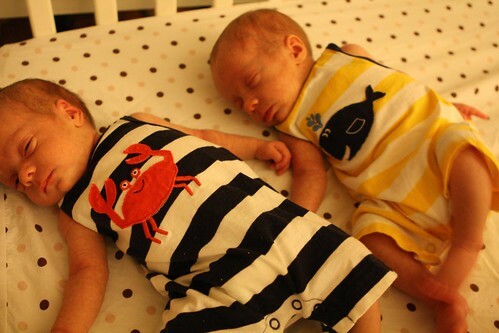 Then again, I was a champion sleeper and it took Henry 9 months+ to come close to sleeping through the night. Huh. Genetics is a Crock! Looks like I just lightened my teaching load for the fall. I hope genetics IS a crock. That will mean they'll be sleeping through the night any day now!